Greetings from Karteros, Crete! SportCrazy.net is here on location at the RC 1/8th Off-Road European Championships. Team Ireland have now completed the 5th round of qualifications this afternoon and we’ll find out shortly how the team have seeded. 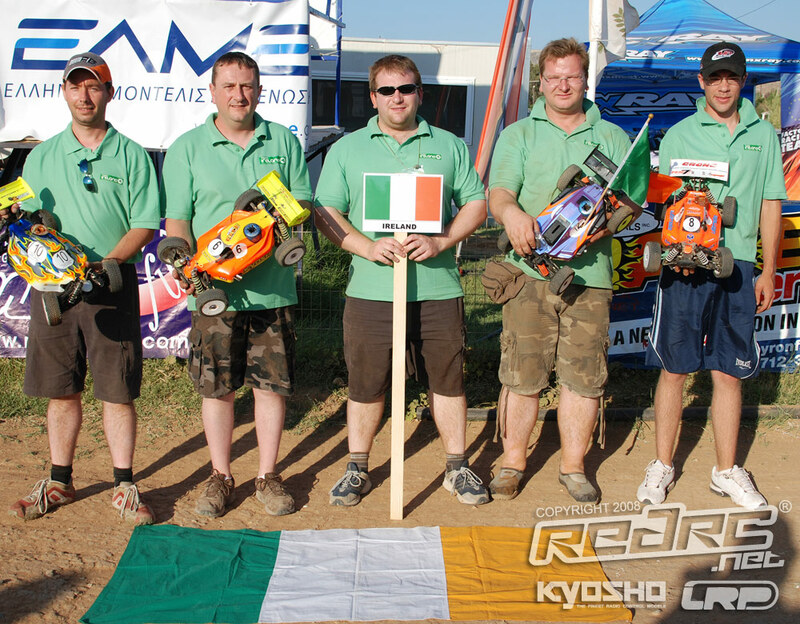 Driving for Ireland are Nicholas Brooker, David Curtis, Darren Hill and Bernd Rapp, team manager is Alastair McDermott! Here’s a picture of the team at the opening ceremony, courtesy of Oisin from RedRC.net. Check out a small selection of photos on flickr, we’ll have more pictures and hi-res videos of the heats uploaded to Vimeo in a couple of days time (it’s hard to find bandwidth to upload several hours of 1080P).